Biofeedback Training involves learning skills to harness the power of mind to control your body’s reaction to stress. A special monitoring device conveys the body’s physiological signals such as skin temperature, heart rate, muscle tension, breathing pattern and sweat gland activity in real time. This information is used to teach skills to handle everyday stress, make positive changes, and improve general health and performance. Biofeedback helps to harness the power of your mind to cope with everyday stress in order to minimize its effect on general wellness and mind/body performance. It helps develop awareness of your body’s specific reactions to stress. Biofeedback is known to provide relief from stress related problems such as migraines, headaches, chronic pain, panic disorders, test anxiety, speech anxiety, irritable bowel syndrome, and high blood pressure. Chances are you have used biofeedback yourself. You’ve used it if you have ever taken your temperature or stepped on a scale. The thermometer tells you whether you’re running a fever, the scale whether you’ve gained weight. Both devices provide “feedback” information about your body’s condition. Armed with this information, you can take steps you’ve learned to improve the condition. There are two reasons why biofeedback is important for your stress management. 1. Biofeedback techniques have enhanced the awareness of physiological functions in the fight or flight response. 2. Biofeedback devices enable you to develop a stronger mind-body connection that is useful for providing stress relief. Generally, when stress is present for long periods, over time one tends adapt to everyday stressors – work pressure, daily hassles, relationship stress, or overwhelming responsibilities. We treat these stress causes as an inevitable part of living. This however could prove unhealthy in the long term. Stress creates wear and tear on your body with the subtle changes in your body going unheeded. Biofeedback helps our awareness to make changes to reduce stress. 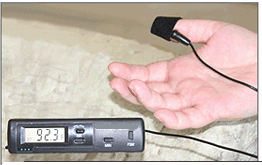 Temperature biofeedback, also called thermal biofeedback, monitors skin temperature. A thermistor on a finger monitors the change in your skin temperature. When the fight or flight response is activated, a common stress reaction is that your skin temperature drops. As blood is shunted to major muscle groups that may be needed to flee or fight, the temperature in your extremities (namely your hands and feet) drops. Temperature biofeedback techniques inform you of the skin temperature in your hand – this may be monitored and one is able to train one to control it. Temperature or thermal biofeedback has been found to be useful in treating migraine headaches and Raynaud’s phenomenon. Have you ever noticed increased tightness in your shoulders and neck after a hard day’s work? A common symptom of stress is excess muscular tension. This tension can manifest itself in tight shoulders and neck, back pain, TMG syndrome, or digestion problems. An electromyogram (EMG) biofeedback machine measures the electrical activity in your muscles. An EMG biofeedback machine provides feedback on the tension in your muscles via electrodes placed on your skin over the particular muscle group. The more tense your muscles the greater the electrical activity. The EMG biofeedback machine provides its feedback on a digital display and/or through an auditory signal such as clicking sounds. Once you learn to recognize the signals of high muscle tension you will know it’s time to step back and use a relaxation technique to stop it getting worse. When stressed, your body secretes more sweat in anticipation of fighting or fleeing from the stressful situation. This increased sweat gland activity (usually invisible to the eye) increases your body’s skin conductance and electrical activity. Galvanic skin response (GSR) biofeedback detects these changes in electrical current and is recorded digitally or by an auditory signal. GSR biofeedback has been helpful in monitoring and controlling stress, hypertension, anxiety, and stuttering. Heart rate can also be an indirect measure of the level of arousal. A low heart rate can indicate relaxation. Also, heart rate monitoring can typically be used to determine the rate of breathing, since heart rate increases and decreases during a single breath. There are also more complex uses of heart rate such as Heart Rate Variability. Primarily, these techniques are used to help train a person to relax, relieve stress, learn proper breathing techniques and become more emotionally stable. Biofeedback Training session are conducted one on one, in a peaceful office setting where the patient is seated in a very comfortable sofa chair facing the screen that is providing feedback. The sessions are typically an hour long. Please contact our office for a free initial consult and a demo of the process.